A pen and ink and wash drawing of a kneeling woman about to be stabbed in the breast, in front of a burning pyre and surrounded by groups of soldiers. Inscribed on the verso: No. 62 JS. 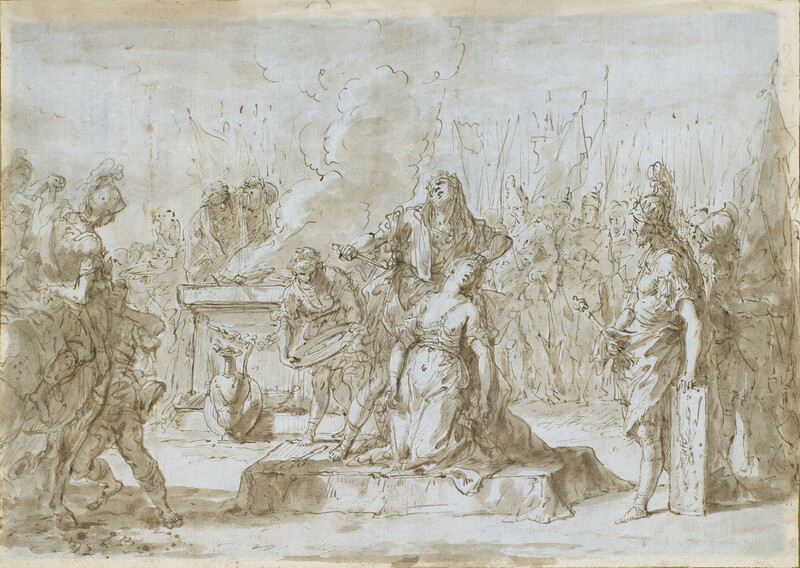 The drawing is a preparatory study for The Sacrifice of Polyxena, painted for Consul Joseph Smith (RCIN 404763) and influenced by Pietro da Cortona's painting of the same subject in Rome and by Veronese's Martyrdom of S. Giustina in S. Giustina, Padua, a church for which Ricci also painted a fresco (God the Father surrounded by angels, c. 1700-01). The drawing is one of several in which Ricci worked out the composition of the painting. Others are RCINs 907042, 907040, 907041 and a drawing in an album in the Accademia in Venice (page 92).